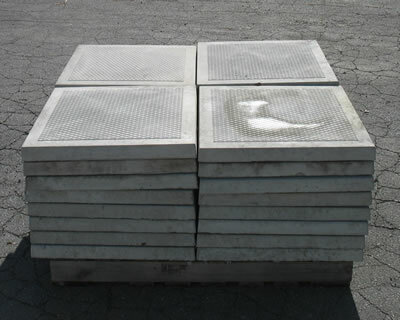 Our precast concrete pavers come in 24 x 24 x 2 inches thick and come with a decorative anti-slip diamond design. Our concrete pavers are perfect for a variety of uses where traction is an important feature such as but not limited to: patio pavers, outdoor tiles, concrete stepping stones, landscape pavers, and pool pavers. Our concrete pavers are large and heavy so they do not move around under your foot when installed properly. Conctact Us today for pickup or delivery for your next concrete pavers project. Pictured above is our large 24 x 24 x 2 concrete pavers with anti-slip diamond surface.